We were heading out of town the next morning, so I made a mental note to have the hubs check into it upon our return. Well….we didn’t need a reminder. 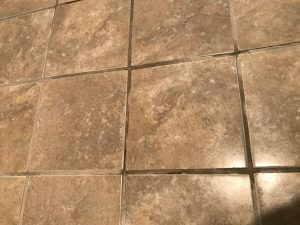 Mold growing underneath the tiles had caused them to shift and cracked the grout. I have seen dozens of homes have problems like this during home inspections. 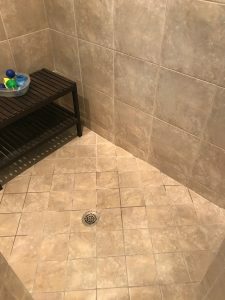 The majority of the time, it starts with a small leak in the tile or grout, which allows water to get between the shower floor pan and/or liner and the tile over time. The moisture is trapped, begins to fester, and creates mold+mildew. 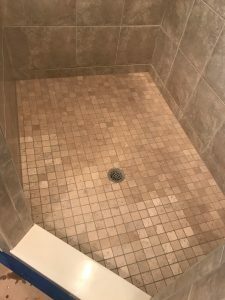 Furthermore, if the pan and/or liner is cracked or damaged, water can seep into the actual floor below, causing much more significant damage. When I say more significant, a few things come to mind. Piggy back on that thought and think about if the shower was on a second story -or- if the moisture and damage had gotten so bad it went through to the exterior walls/windows… Then you’ve got a real serious problem. 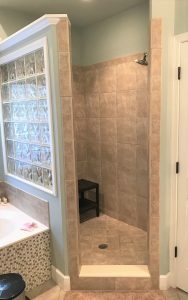 Bracing myself for the worst I contacted a licensed and insured plumber. 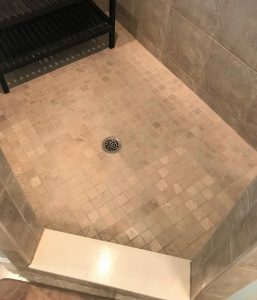 He came out and confirmed that the entire shower floor would need to be pulled up so he could confirm the integrity of the pan/liner below. LUCKILY ours was not comprised and we would only need to re-tile the ground floor and make it impermeable once again. After cleaning up any lingering icky, he laid a fresh layer of mortar and evened it out. 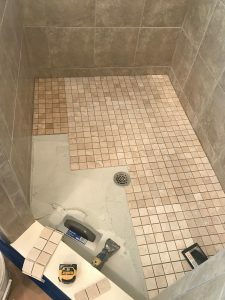 Next came the installation of the new travertine mini tiles. Fun fact: tile, granite, and natural stone often have different variations in color based on when and where they were harvested/produced. When ordering your materials, try to order all at once and from the same place. Once its all set and the design flows, its time for new grout. We went with a sanded version to match the distressed style of the tile. 72 hours later, the floor is dry and ready for your wash-rinse-repeat! 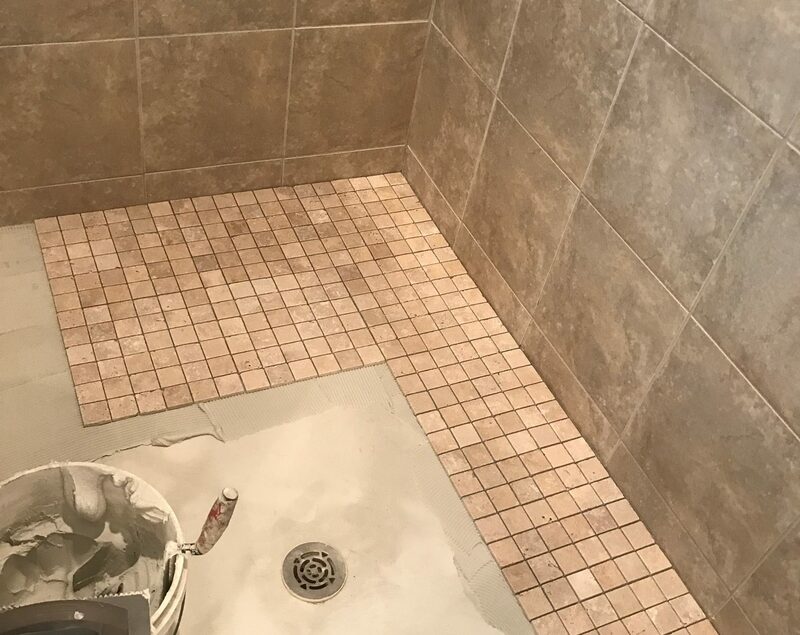 Moral of the story: from time to time, it is imperative to check and caulk your wet tile surfaces- especially in showers. 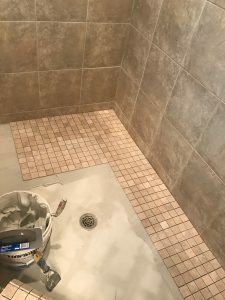 The $8 tube of grout caulk or service call to your friendly neighborhood plumber will cost drastically less than if you were to ignore regular maintenance. 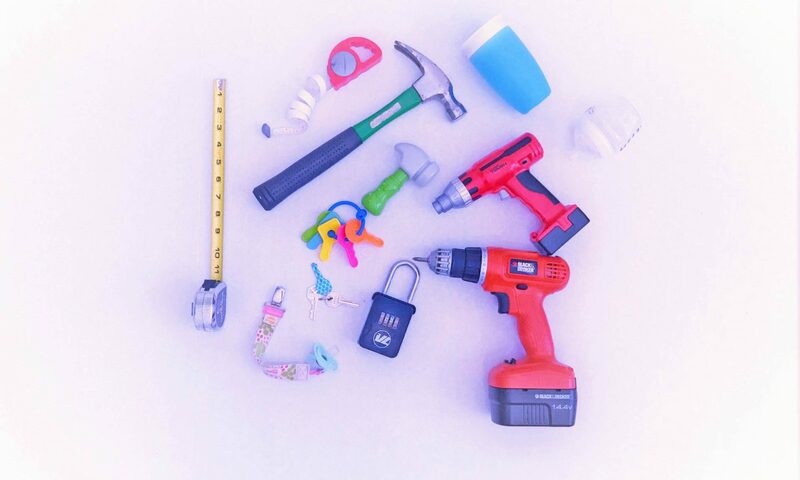 A tiny crack or give can cause major problems.